It was late Firday night, and I seriously needed some mindless entertainment. 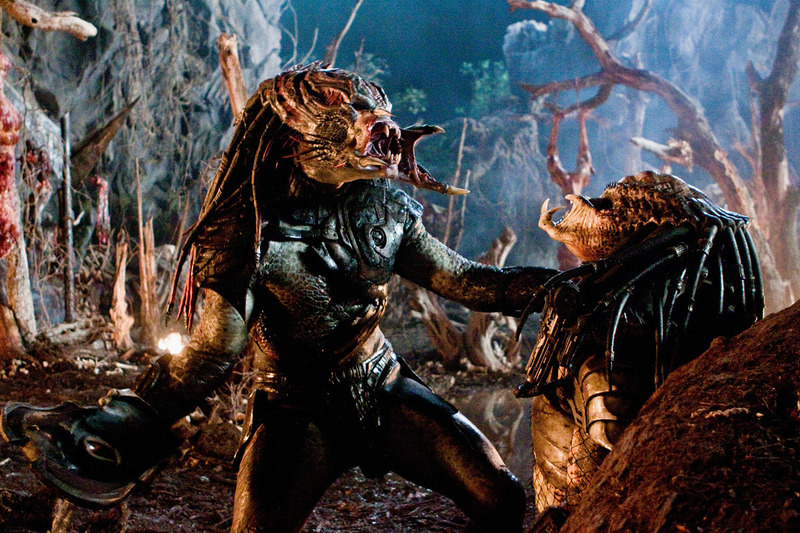 Fortunately, HBO had just premiered the new PREDATORS flick, and it had the right mix of familiar faces and a decent premise. Adrien Brody’s gigantic nose versus some predators? Why not! I’m not sure how this film doesn’t fall flat on its face. It takes itself very seriously (save for Laurence Fishburne who has a great few scenes and knows what he is in) and it takes a long time to develop. I know I am always deriding films for not taking their time. But when you are making a movie called PREDATORS and your cast opens the film by air-dropping out of the sky and into a foreign looking place, the first act twist shouldn’t be that there are extra planets and suns in the sky. It should probably come a little before that. But the actors in this are good enough. This film has Adrian Brody, Alice Braga (REPO MEN and I AM LEGEND), WALTON GOGGINS (THE SHIELD), and DANNY TREJO (the guy who learned how to act while actually serving time in prison). And they work it. It’s not perfect, and the dialogue is trying a little too hard sometimes, but this mostly works. Eye rolling scenes? Yeah we get a couple. But we also are privy to a couple of genuinely cool spots. The creature which serves as the other prey on the island is awesome, the boars are cool, the predator on predator violence works, a samurai fight pays homage to a whole different genre and somehow feels of the same film, etc. In a sequel to a landmark (if not perfect) sci-fi flick, all you can ask is to hold back some cheese and give the audience a few ‘that-was-cool’ moments. This does that. They even manage to work in a mention of Arnie’s character from the first film AND throw in an alien skull from the ALIEN flicks, though this film smartly stays away from the sub par AvP debacles. They don’t kill the actors in the order you would think, which is nice. They throw in a few twists, which is nice. It has some cool looking locations, which is nice. Look, this was written and produced by Robert Rodriguez. So this is a competent, if sometimes self-indulgent film. But it works. My expectations for it were certainly low, so it did exceed where I thought it would be. A ringing endorsement? Maybe not. But certainly worth giving a shot to. ~ by johnlink00 on August 14, 2011.